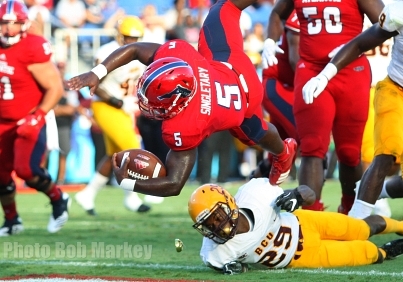 FAU football tallied their second win in as many years against Bethune Cookman with a 49-28 victory against the Wildcats on Saturday evening in Boca Raton. Unlike last weekend's strategy against Air Force, they rode the running game and received a record scoring performance from running back Devin Singletary. Sixty-one of the Owl's 91 plays were on the ground. Singletary (photo) notched his 16th straight game with at least one rushing touchdown early in the game with a seven yard score. But with the Owl defense humming to shut down the Wildcats and keep the offense on the field, Singletary then rattled off three more for a 29-0 FAU lead near the end of the first quarter - giving him four for the period to tie the single game touchdown mark. Later in the second period, after Bethune Cookman (1-2) managed a score, he then crossed the goal line to establish a new program milestone with five touchdowns. "Our whole thing was to run the ball today, so we did a good job of that", said Coach Lane Kiffin. After posting a record game himself last weekend against Air Force, quarterback Chris Robsion settled for a 16-of-27 showing for 171 yards, 1 TD, and 2 INT. Robison's 10 yard connection to Jovon Durante put Florida Atlantic (2-1) up 43-14 in the third quarter. DeAndre Johnson would takeover over signal calling duties for the Owls therafter, as coach Kiffin looked to gain valuable game experience for other members of the roster. Johnson proceeded to net his first touchdown on the season with his legs, tip-toeing his way into the endzone, from 21 yards away. Bethune's counter bootleg score made it a 49-28 affair with 12:01 to play, as the extra point attempt was blocked - further compounding the Owls' stretch of special team's miscues. Marking the third quarterback to see action, Rafe Peavey then stepped in for FAU. Looking to give FAU to a perfect mark on fourth down, Peavey saw a high snap thwart the attempt. Needless to say, the team's 7-of-8 final effort was also a program record. Singletary narrowly missed tying the all-time individual Conference USA single game touchdown mark of six, set by LA Tech running back Kenneth Dixon. Willie Wright posted a 51 yard punt return on the evening. LB Rashad Smith registered his 2nd interception in as many weeks. Harrison Bryant led Florida Atlantic receivers with 82 yards on five catches. In thier last two meetings against BCC FAU averaged 47 points per outing. Safety Jake Stoshak batted down a Wildcat pass attempt. The Owls used four quarterbacks in total for the game. FAU posted just a 33% success rate on 3rd down, which was below thier season average. 26 Owls registered tackles on the night, and Ahman Ross netted a high of four. 11 players saw carries, with Kerrith Whyte reaching the century mark on 15 attempts. FAU had 559 yards of offense, and improved thier season average to 6.1 YPP. Of FAU's seven touchdowns, six were on the ground. Announced attandance was 19,107 which was 5,084 lower than last weekend. The Owls will conclude the non-conference portion of thier 2018 schedule with a trip to #18 UCF on Friday night. The contest will be aired nationally on ESPN, and is scheduled to kick-off at 7:00 PM. FAU lost the lone meeting against the Knights 33-29 back in 2003. "We've got a lot of work to do for a lot better opponents coming up in the next couple of weeks", Kiffin said. Kiffin announced in his post game conference (link below) that Robison will start at quarterback against Central Florida.